Prof David Fulcher has over 30 years' experience as a doctor, and over 20 of those as a specialist in Immunology. Prof Fulcher (MB.BS, PhD, FRACP, FRCPA) has held every major national teaching position in Immunology and Immunopathology, including Co-ordinator of Advanced Training in Immunology, and Chair of the Joint Specialist Advisory Committee in Immunology (for the Royal Australasian College of Physicians), and Chief Examiner in Immunopathology (for the Royal College of Pathologists of Australasia). He was Director of Physician Training and then Network Director of Physician Training at a major public hospital. He was clinical director of Immunopathology and flow cytometry for a major public hospital diagnostic pathology service for over 8 years. Prof Fulcher has active research and teaching links to Australian National University, where he has an appointment as Professor of Immunology in the Department of Immunology and Infectious Diseases, John Curtin School of Medical Research. He is convenor of the "Advanced and Applied Immunology" biology course, and involved in researching the genetic pathogenesis of Immunodeficiency and Autoimmune diseases as part of the Centre for Personalised immunology, which received NH&MRC funding as a Centre for Research Excellence. There, he is responsible for detailed leukocyte phenotyping using multicolour flow cytometry, and is convenor of the teaching outreach arm, the School of Personalised Immunology. Clinical Immunology refers to any condition in which abnormal function of the immune System is involved in causing disease. 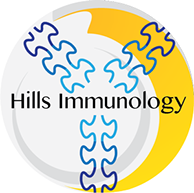 The scope of the Clinical Immunologist varies from city to city; Dr Fulcher covers the breadth of immunological disorders, particularly autoimmunty, immunodeficiency disorders, and allergy.